BIC For Her Gel Pens are designed just for women. Soft contoured grip delivers all-day comfort. Sleek pen silhouette and jeweled accents add style. Stylish design also features delicately designed floral barrel, embossed nose cone, convenient clip, and a 0.7mm medium point. 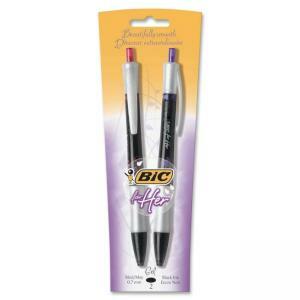 Retractable gel ink pens are refillable.